Boy, my d og loves to run off leash—tearing down the beach, chasing her ball in the park, or romping through the tall grasses on hikes. In the central coast area—Santa Cruz and Monterey Counties—we have limited areas where dogs are allowed off leash. And this can sometimes be tough when you have a dog that really needs to romp. 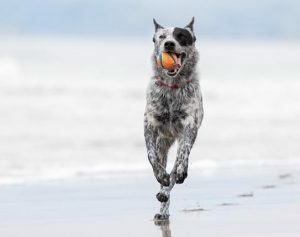 We have those areas that are designated for off-leash activities such as dog parks and the few beaches and hiking trails where you can legally take your dogs and let them romp free. We mostly have areas that are designated on-leash only. But there are also those places I’ll call the gray zones—they may legally be on-leash only, but customarily they are where people do take their dogs off leash. One of the biggest problems with dogs being off leash, whether legally or not, is that people forget that dogs are, well, dogs, and that we all need to follow some basic social etiquette to be able to get along. For many years, there has been both spoken and unspoken etiquette that most people follow. Here is a summary. If you have a social dog but they are still a bit unruly, get training! They can learn to be good citizens, but you may need to keep them in more controlled environments until they are up for the challenges of off leash romping in public. Put your phone or whatever might distract you away and actively supervise your dog—help her be a good citizen! Please, keep your dog on leash at all times. Yes, your dog may be the model citizen off leash. They may walk perfectly next to you and never go and say hi to others. But your dog being off leash while other dogs are on leash can cause conflict just because one is on leash and one is off leash. Dogs who are on leash have to communicate differently than dogs off leash, and this can lead to misunderstandings between the dogs. In addition, one being off leash and the other on leash causes undo stress for the leashed dogs. Simply put, your dog being off leash is unfair to others. Please be kind and respectful. What about the gray zones—those places that are legally on leash, but customarily off leash? So what about all of those places where it is technically illegal to have your dog off leash, but everyone does it. (I can think of a few beaches and hiking spots where this is the case.) Etiquette, common sense, and basic kindness require anyone who has their dogs off leash in areas where they are technically legally required to be on leash follow the off leash area customs at minimum! Dogs should be under voice control and people should be paying attention. In addition–and this is important!—if you see someone in one of these areas with a dog on leash, call your dog over to you and leash them up right away. Let them pass peacefully before you take your dog back off leash. Just because you choose to break the law doesn’t mean others have to do the same. No dog is perfect and sometimes they are rude (or worse) to others. But following basic etiquette can help everyone get along. If we all take a little time to be responsible, respectful, and kind, all of our dogs can thrive and be happy. « Help, My Dog Is a Barkaholic!